"Doisac. Doisac. Doooiisac. Doi-sac. Planet of the Brutes everybody! Coulda' named it anything, they could have! But they named it Doisac. Doisac!" Doisac, designated CE-75-2113 c by the Forerunners, is the third planet of the Oth Sonin system and the homeworld of the Jiralhanae. The planet possesses three natural satellites, Warial, Soirapt, and Teash. Doisac's surface inhabited by ancient Brutes. Because of its harsh environmental conditions, numerous predators evolved on Doisac throughout its history, among them the initially arboreal Jiralhanae. Doisac was visited by the Forerunners during the Lifeworkers' Conservation Measure. The Jiralhanae were one of many sentient species indexed by the Librarian for preservation aboard Installation 00. After the Halo Array was fired, the Jiralhanae were returned to Doisac to begin rebuilding their culture. Doisac is a very war-torn land due to constant Jiralhanae civil warfare, typically between clans. Despite their savagery, Jiralhanae proved intelligent enough to achieve spaceflight and space-faring status. However, their warlike nature inevitably led them into conflict, and eventually the various Jiralhanae master-packs fell into a massive war known as the First Immolation. The planet became heavily damaged from the use of nuclear weaponry and almost led to the extinction of the Jiralhanae. This war caused the collapse of Jiralhanae society; by the time the Covenant discovered them in 2492, the species had just rediscovered radio and rocketry. In their primitive state, they were quickly defeated and absorbed into the Covenant. After their induction to the Covenant, many Jiralhanae left Doisac to settle on Covenant colonies or live on High Charity. During the final months of the Human-Covenant War, it is more than likely that Doisac was a spot for battles between the Covenant and the Sangheili. Although most Jiralhanae returned to Doisac after the war, some were allowed to live on Sangheili worlds as laborers. Many also continued to inhabit the worlds the Covenant had previously given them; however, due to their lack of advanced technology and their disorganized society, they were unable to obtain resources or even food for themselves, and instead resorted to raids on Sangheili and Kig-Yar colonies. The Jiralhanae on Doisac have lacked a strong leader to stabilize them since the Covenant's fall. However, by 2558, Atriox had become a symbol to the Jiralhanae on Doisac, with many rallying behind him by enlisting in the Banished. Doisac is a tropical world, where volcanic activity is common. At least half of Doisac's surface is covered in rain forests, while the other half is largely composed of molten rock, lava, and large volcanoes. Doisac has a very harsh environment, yet it is still preferred by many Jiralhanae. The rocky, forested planet also contains large amounts of deserts, and a few seas of water. Its environment is very Earth-like, with forests and oceans, although its gravity is twice that of Earth. It has been noted, however, that its terrain is dominated by magma and magnetism, hinting at high tectonic activity and rich magnetized iron deposits. It is possible that Doisac is closer to Oth Sonin than Earth is to Sol because its surface temperature/climate is slightly more tropical, ranging from -15°C to 52°C (5°F to 125.6°F). Alternatively, its atmosphere may cause a greenhouse effect, either due to the actions of the Jiralhanae or naturally, trapping heat and warming up the planet in a similar fashion to Venus. The planet is orbited by three natural satellites; Soirapt, Warial, and Teash. The latter two have some form of Jiralhanae settlements on them. 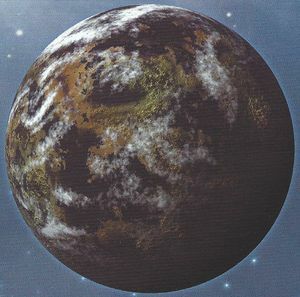 The environments and structures of Doisac that are depicted in Origins appear almost identical to the planet Kashyyyk from the Star Wars franchise. The Palace of the Hierarchs on High Charity had drapery that contained the continental tracery of Doisac within a circle, to make visiting Jiralhanae, such as Tartarus, feel important. Doisac, as shown in the Waypoint Bestiarum.